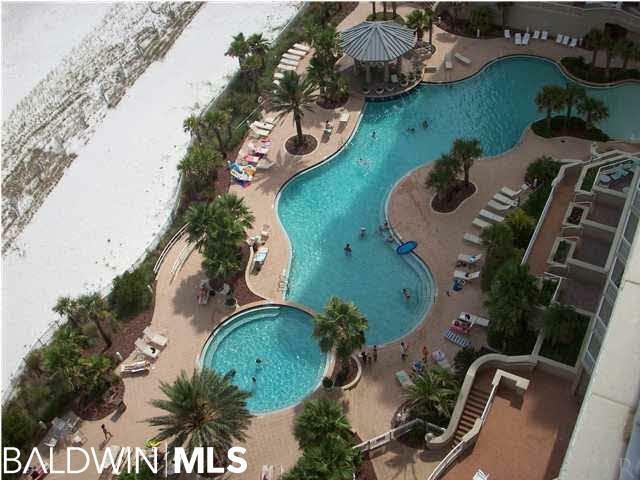 Perdido Key, Florida-Original Owner of this prestine condo in the Indigo Condominium Community. As you enter this gated community, you'll appreciate the almost four hundred palm trees that highlight the landscaped grounds. Inside unit 1502E, a large Gulf Front Balcony overlooks the Gulf of Mexico and a North Balcony overlooking the Lost Key Golf Course. Great floor plan with 3 bedrooms and 3 baths. Each bedroom has its own bath, with each bedroom it's own TV. The front bedrooms has a chair that makes out to a single bed, owners has two roll away beds for extra guest or grandchildren. Sofa makes into a small bed..Overall your can sleep comfortable 12 people. Great place to enjoy family we have for years.. Huge master suite with walk-in closet and Master Bath with over sized jetted tub and tiled shower. Large walk in laundry room. Seller paid extra to have Travertine flooring throughout this unit when he purchased it new. Also, a climate controlled storage unit on ground floor to put all your beach gear in. The tropical palm trees accent the pool area creating a beautiful tropical paradise. Relax in the crystal blue waters of the 144,000 gallon pool, or take advantage of the shade cast by the poolside Gazebo. VERY STRONG Homeowners association. Indigo is a private gated community that sits on approx. 7 acres and fronts the Gulf of Mexico. Indigo offers you private elevators that opens to your own private foyer area, or your have a private personal elevator. Community amenities include: social room, movie theater, state of the art fitness room, approx 6,000 sf pool plus many others. Indigo is a Destination Resort or a lovely place to call Home! Call today for your private tour! Furnishing will remain, bring your clothes..Paining in the master bedroom can be purchased, but does not remain. Agents please view the documents.